Assam Chief Minister Sarbananda Sonowal condoled the demise of veteran journalist, author and human rights activist Kuldip Nayar, who breathed his last in New Delhi on Thursday. “His books are great sources to knowledge about the political and social evolution of the country. Moreover, as a nominated member of the Rajya Sabha and High Commissioner of India to United Kingdom he made notable services to the nation,” stated Chief Minister Sonowal. Chief Minister Sonowal also termed Nayar’s death as an irreparable loss to the nation and said that he would always be remembered for his contributions to the society. The Assam Chief Minister also conveyed his deep sympathy to the bereaved family and prayed for eternal peace of the departed soul. 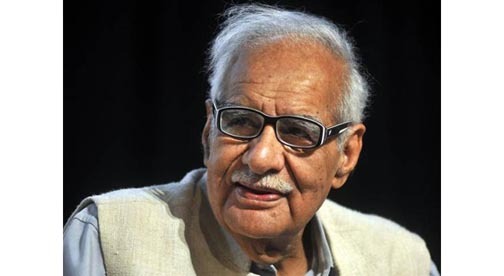 It may be mentioned that Kuldip Nayar, who fiercely fought for press freedom and protecting civil liberties, died at around 12.30 am at the Escorts hospital. Nayar was reportedly suffering from pneumonia and was admitted to the hospital just five days back. The veteran journalist, who is survived by his wife and two sons., had also served as the Indian High Commissioner to the United Kingdom in the 1990s and was nominated to the Rajya Sabha in 1997.